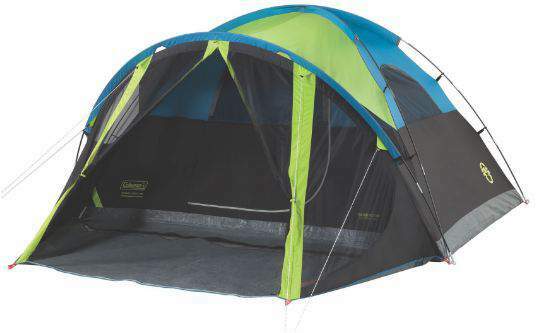 Coleman Carlsbad 4 Person Tent is a great dome style car camping tool with the dark rest design, a nice screen room, and a great price tag. Coleman Carlsbad 4 Person Tent with screen room and dark rest design. 2 side windows plus the window in the door. The tent is built as an extended dome structure with the main room under the dome and the screened room in the extension. The screen room is with angled walls and you do not have a full protection here, there are no panels. So the floor in the screen room is not completely sealed; in fact, you have a mesh section they added so that the rainwater can get out, see the picture below. The floor in the screen room is with the openings for the rainwater. So one could call this area a porch although this is a floored zone and it is fully enclosed against bugs. This screened area is perfect for cooking and for sitting as long as it is not raining. It can indeed be used for sleeping as well if the sky is clear. In any case, if you want a tent with a screen room and you think this one is not for you, check my list of screened room tents. This is yet another exceptional feature of this tent, the dark rest technology. Some call it also ‘lights out’ or ‘dark room’ design. So you have reflecting features in the fly, they claim that it blocks 98% of sunlight, and also the materials are dark, and the inner area is far darker than in standard tents. Due to the reflected light, the atmosphere is cooler, they claim up to 9.5%. With such a design you can sleep longer in the morning, and you can also take a nap during the day. They have used this technology is several of their tents, see this giant Coleman Valdes tent as an example. In the video below you will see how it works; note that the tent in this video is the Carlsbad 6 but the structure is practically identical with respect to the dark rest design. Note that this Carlsbad 4 tent is sold on Amazon together with the Carlsbad 6 tent, and the pictures there are exactly the same. But this is misleading because the 6-person tent is a fast-pitch design, and the Carlsbad 4 is not. I have asked and got the confirmation about this from the seller directly. If you are not familiar with this terminology, the fast-pitch models have a hub element and the poles are shock-corded and pre-attached to it. However, the Carlsbad 4 tent is without the hub and you have the sleeves instead, see the picture below. So this brings us to the issue: freestanding or not. The main dome part looks completely freestanding. When you pass the poles through the sleeves and attach them to the corners, the structure is self-supporting. In principle, the same applies to the pole above the screen room. But you have to tension the screen room part to have it fully functional, so you have to stake it to the ground. This is why the tent as a whole is not fully freestanding. Here is the tent shown without the rain fly, so you can see the sleeves for the poles. There is no hub element here. The Coleman Evanston 4 with screened porch is not a dark rest tent. The dimensions are the same. Do not mix this with the Coleman Evanston 4 Person Dome Tent, which is without the screened room. The capacity declared by the manufacturer is 4 people. The total area is 99 ft² (9.2 m²) so you have per person 25 ft² (2.3 m²) and this looks quite good to me. But bear in mind that the screen room is not fully protected from the rain and you cannot keep all things there in the case of rain. So you only have the fully protected inner dark room which offers 15.75 ft² (1.46 m²) per person. This is enough if you use the backpacking principle, you have enough space to put 4 sleeping pads on the floor. But this is a car camping tent, therefore I would downgrade the number of users to maximum 3 people. The tent can be used for couples, and you can easily fit a queen size bed in the dark room. You realize this when you check this Coleman Queen Size bed from the same brand. Note that the inner room is 9 x 7 ft (274 x 213 cm) so you have enough space with such a bed. If you use such a bed, you are off the ground and you have plenty of space to store your gear under the bed. This is not so if you put a large air mattress on the floor, the space under the mattress is lost. Seasons-wise, the tent is with a partial fly, and you have a lot of mesh around. This is great for ventilation so use this tent for summer car camping, 1 to 1.5 season maximum. For a cooler environment and for much more rain better check one of the tents in this list. The main entry door is on the screen room, this is all mesh with an inverted T-shape zipper. The inner door is with mesh and panel for protection and privacy. The tent is with 2 side windows, so this is a nice feature which you would not expect from a dome style tent. But this is an advantage of having such a partial coverage fly. One of the poles creates awnings above the windows and you can keep them open all the time. Yet another window is on the inner door. The fly and the tent’s fabric is a polyester taffeta 75D. There is no info about waterproofness rating and I would not expect much from it. But they claim it is waterproof and this is what they call the WeatherTec system and Polyguard fabric with inverted seams. The floor is a durable plastic with the bathtub design and with their patented corner welding for seams. The poles are fiberglass, so this is not a particularly durable material. There are 4 of them, 2 create the dome structure and one is above the screen room. The earlier mentioned ridge pole creates the awnings above the windows. The tent comes with an electric cable port, and you have a couple of very small pockets on the walls. They could have built it much bigger. Plan some 15 minutes to set this tent up. You start by passing the poles through the sleeves, and after attaching them to the corners with the pin-and-ring system which you have, the tent becomes self-supporting and freestanding. The screen section must be staked out. Adding the fly is easy because it is so small. Cool atmosphere due to the dark rest technology. Weight: 7.96 lb (3.61 kg). Total dimensions: 11 x 9 ft (335 x 274 cm). – Inner room: 9 x 7 ft (274 x 213 cm). – Screen room: 9 x 4 ft (274 x 122 cm). Total area: 99 ft² (9.2 m²; 5.84 + 3.34 m²). Total area per person: 25 ft² (2.3 m²). The inner area per person: 15.75 ft² (1.46 m²). Peak height: 4 ft 11 in (59 in; 150 cm). Packed size (L x D): 24 x 6 in (61 x 15 cm). 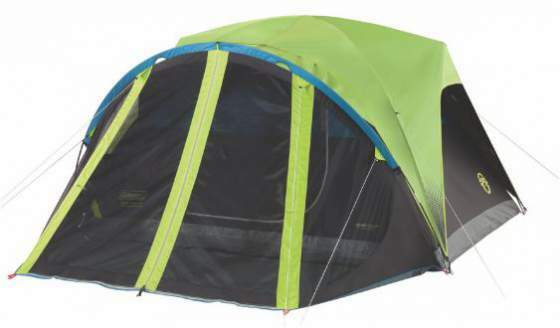 So I would conclude this Coleman Carlsbad 4 Person Tent review by stressing that, because of its screen room, this tent is quite unique among the tents of this size. It is also built with the dark rest technology which is a huge bonus as well. Its packed size and the weight are such that it might be used for hiking as well, though the design is obviously for summer car camping and I have included it in my list of 4 person car camping tents. But in any case, this is a versatile and pleasant tent. However, it is not for serious weather conditions and I would not put it to harch tests. You will have to pay much more and choose a different design if you need a tent for all weather situations in a 3-season use. If this tent is not what you need please check my page with tents, there are many tents presented there and you will surely find something for you. I have already mentioned that they also have a larger version with more features, the Coleman Carlsbad 6-Person Dome Tent with Screen Room. Check also this Vango Capri 400 XL with more than 13 square meters of space for 4 people in its 3 rooms. What size footprint do I need for the Coleman Carlsbad 6 person dome tent? In principle, you would need it only under the inner area and this is 9 x 7 ft (274 x 213 cm).